There is a simple truth, the DJI Goggles were made for the Mavic Pro. Maybe that’s only mostly true, but one thing is for sure, these powerful VR goggles are the perfect companion to the Mavic Pro, and one of the coolest drone accessories we’ve tried to date, thanks mostly to OcuSync. Operating in a handful of ways, you can enjoy the DJI Goggles with a few drones wirelessly or a few more drones using a data cable. Stepping things up, HDMI input allows you to use the goggles as a display for near any media device. Pretty neat, but we’re here today to share the peak of the technology, the best use-case for the DJI Goggles, as an FPV headset for your Mavic Pro. This is that last of our regular updates for this article. Both the Mavic Pro and the DJI Goggles are still in production, but both have newer versions available for purchase. 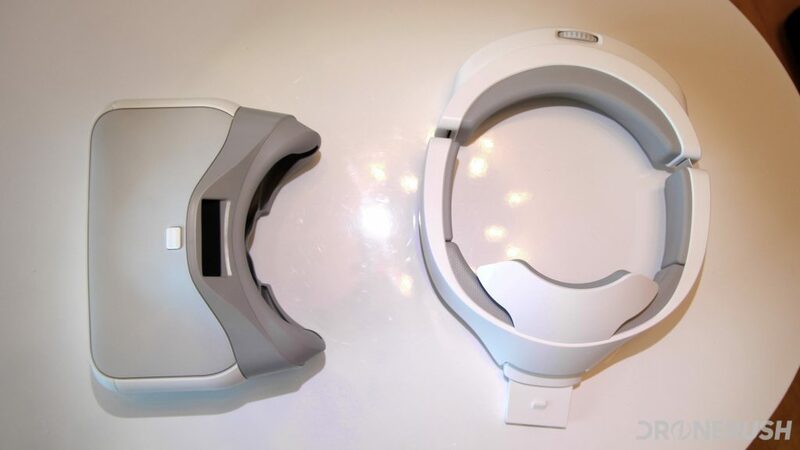 Before we get started, what are the DJI Goggles? I hope we’ve established that the DJI Goggles are a high-end VR headset, even when stacked against some of the better VR headsets out there. The dual 1080p monitors offer up a Full HD experience of the total 3840×1080 pixels, equivalent to a 216-inch display at 3-meters from you. I can confirm that is uncomfortably large when used as an extra computer monitor, but is superb when consuming a movie or, as we hope to show off today, using as a FPV headset for your drone. The DJI Mavic Pro is a compact, folding quadcopter, one of the best on the market today. It has a 4K camera that has superb stabilization. Perhaps there are better cameras out there on drones, but the thing is, we’ve yet to see as capable, compact and convenient of a machine for the price. OcuSync is the name of the game, folks. 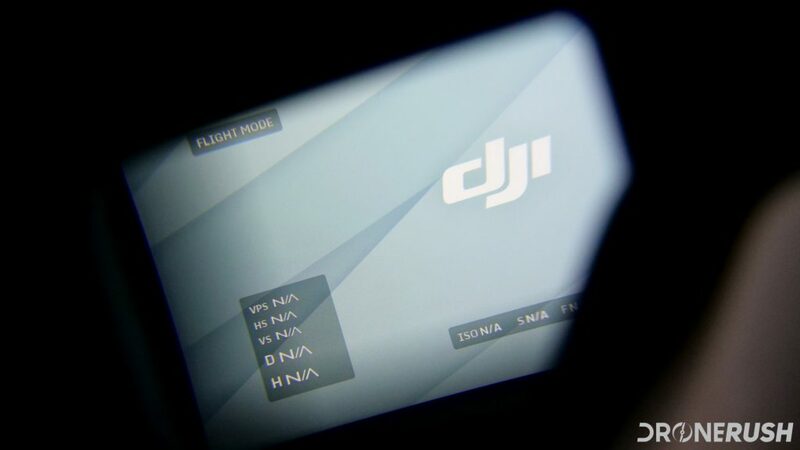 DJI’s proprietary connection technology for their drones is included with, pretty much, just the Mavic Pro. 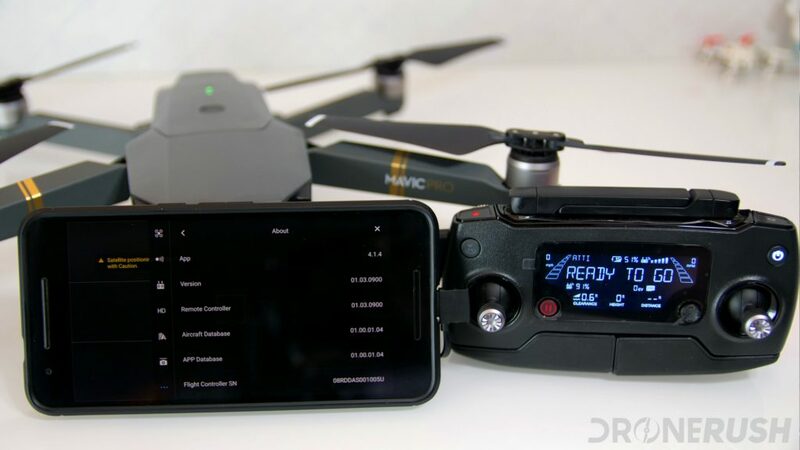 OcuSync is what allows you to connect two controllers to one drone, or in this case, two DJI Goggles to one Mavic Pro. The DJI Mavic 2 Pro and Mavic 2 Zoom are super updates to the original Mavic Pro. The newer drones offer better flight times, new and better cameras and the all new OcuSync 2.0 connectivity. OcuSync 2.0 is backward compatible with the original OcuSync found in the DJI Goggles, making these the best folding drones you can connect to the Goggles. DJI Phantom 4 Pro V2.0 has OcuSync! Not sure I need to say much on this subject, take the Phantom 4 Pro and Phantom 4 Pro+, add in efficient propellers and updated ESCs for the motors, then add OcuSync to get the new Phantom 4 Pro V2.0. 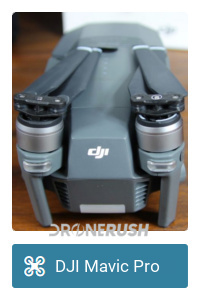 This updated drone can connect to your DJI Googles wirelessly, making them only the third drone to enjoy this pleasure. The second drone was the Mavic Pro Platinum, if you’ll accept that. 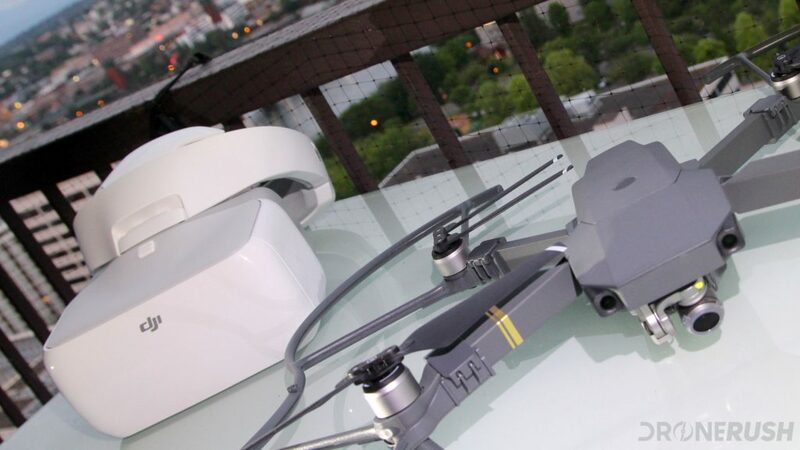 Nonetheless, this is now officially the best drone that can connect to your Googles. 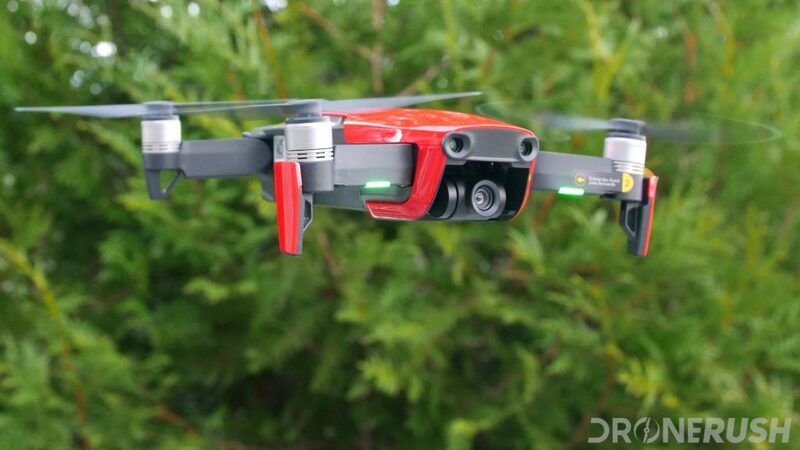 I keep saying that the new DJI Mavic Air takes the best of the DJI Spark and Mavic Pro, improves on them and adds new tech to make the best compact drone possible in their line. Truth is, that’s a bit of a lie. The biggest exception, the thing that makes my statement a lie, the Mavic Air does not have Ocusync. Ignoring a few of the other range and connectivity benefits, this is very relevant today, as the Mavic Air cannot work wirelessly with the DJI Goggles. You need to connect the two using a USB cable. If you can forgive the need for a cable, the Mavic Air is as good of a drone as you can get, short of the DJI Mavic Pro, for flying with the Goggles. 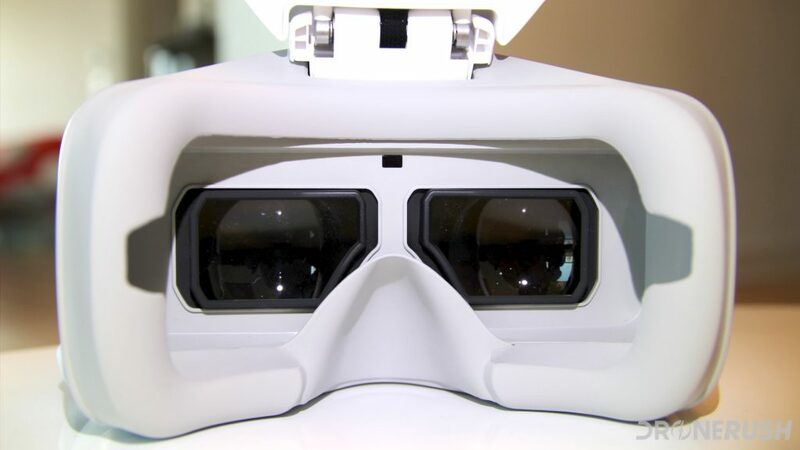 At face value, the DJI Goggles are a new view from the sky. A great way to experience flying, or to share the view from on high with someone within a few miles of you. Don’t get me wrong, you’ll benefit most from keeping Goggles and pilot close together, but you don’t have to. Fire up and connect your Mavic Pro and its controller like normal, then power on and connect your DJI Goggles to the drone. 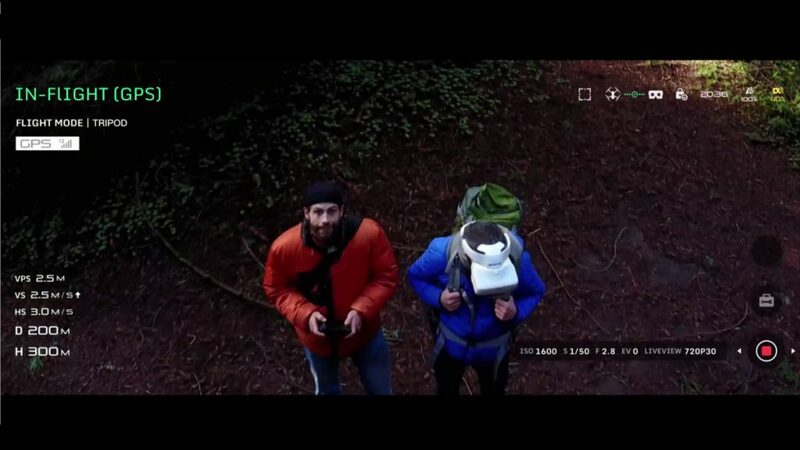 You’ll be greeted by a full screen view from the drone camera. Drone and Goggles information are on the top, drone telemetry on the left side, camera info across the bottom and some controls and settings in the bottom right. The wearer of the Goggles can be a passive participant, simply enjoying the view, or they can get involved a little. 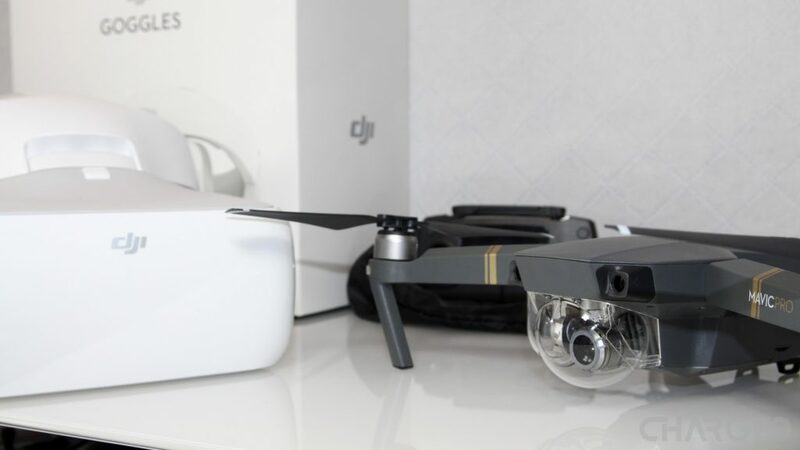 The primary thing you’ll see in advertisements for the DJI Goggles is Head Tracking – the ability for the Goggles to control the camera gimbal on the drone. Look up, the camera goes up, look down, you get the idea – all the while, the pilot maintains control using the remote and their mobile device like normal. Full screen and Head Tracking are just two of the available modes. In addition to the newly introduced modes, the Goggles can tap into existing flight modes as well. Let’s take a look. As the name implies, make all the tidbits go away, sit back and enjoy the full unobstructed view from your Mavic Pro. The pilot retains full control of the craft, but the gyroscope and other sensors in the DJI Goggles take over the camera gimbal. Turn your head, look up or down and the camera will follow exactly your movements. As I say, this is the most common promoted feature of the DJI Goggles + Mavic Pro combo, an amazing way to share the view from the sky with someone who, maybe, does not know how to fly. Taking things to the next level, we have a mode that allows the wearer of the Goggles to spin the drone. Once again, the pilot retains control of the drone’s flight path and tilting the Goggles will move the camera up and down, but turning your head will now actually turn the aircraft. We hope we don’t have to explain what risks this poses with any tricky flights. Out in the open, I can think of few better ways of allowing my friends and family to experience the flight, without handing over my controller. The last two modes built into the headset simply quick adjust the camera gimbal. Just as the names imply, one mode toggles between pointing the camera straight down and straight forward. The other mode twists the gimbal between portrait and landscape orientation. The first item I want to discuss is TapFly. It is, effectively, the only available mode that lets you actually control the flight path of the Mavic Pro. As the name implies, you tap on the screen and the drone autonomously maneuvers to that location. This is a fun mode to try with just your mobile device, now we can enjoy it with the DJI Goggles. 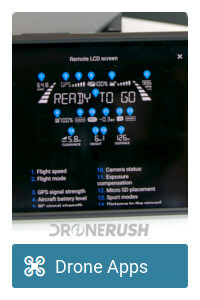 The additional flight modes, from the craft and connected DJI GO 4 app, that you can tap into focus mostly on how the drone operates. Sure, ActiveTrack can be used to maneuver the drone in the air, but mostly, selecting Cinematic Mode or Tripod Mode just adjusts the flight characteristics of the craft. The remaining modes you can access are the Terrain Follow and the newer Fixed-Wing flight mode. Again, these are modes that you will need the remote control to actual operate the craft, but being able to access them from the headset is a sure-fire way to keep your head in the Goggles. Not everyone will be able to wear the Goggles during the actual flight, no worries, DJI thought of that, too. When your flight is done, swipe through the features in the Goggles to download a copy of the flight footage for ‘offline’ viewing. This is limited to 1080p footage, sadly, so if you shoot in 4K from the Mavic Pro, you won’t be able to watch those flights later. This is a huge miss, in my opinion. If you are listening, DJI, please allow me to transfer 4K video to the Goggles. Also, this has to be done as a direct download from the Mavic Pro to the Goggles. Once again, DJI, please fix this, I want to manually transfer files from card to card, or at least let me put the microSD card from the Mavic into the Goggles and have it just work. That’d be great. On a scale of pretty good to fantastic, I give the DJI Goggles a solid wow! I’ve at least peered into almost every high-end VR goggle on the market, except the Sony Playstation VR goggles. I feel like the comfort and fit are on par with some of the best, but the overall display size and quality are unmatched. There is no doubt that hauling the DJI Goggles along more than doubles your carrying needs over just the Mavic Pro. They do split into separate headband and goggle, but the goggles are about the size of the Mavic Pro folded and the headband can wrap around the entire package. Folks in the drone racing community may be used to this, but most Mavic Pro users I know purchased the folding machine for its portability – ready to tackle some hiking trails. Part of the weight of the DJI Goggles is the embedded 9440 mAh battery. DJI says you’ll get up to six hours of flight time in the goggles. I admit we have not yet burned through an entire battery just flying the drone, we mix in connecting to a PC or downloading videos from the drone to just watch in the headset. Our mixed use has averaged (roughly) five and three quarters of an hour. We’ll update our DJI Goggles review with ongoing battery usage details. For all the specs and details, check out our full review of the DJI Goggles. 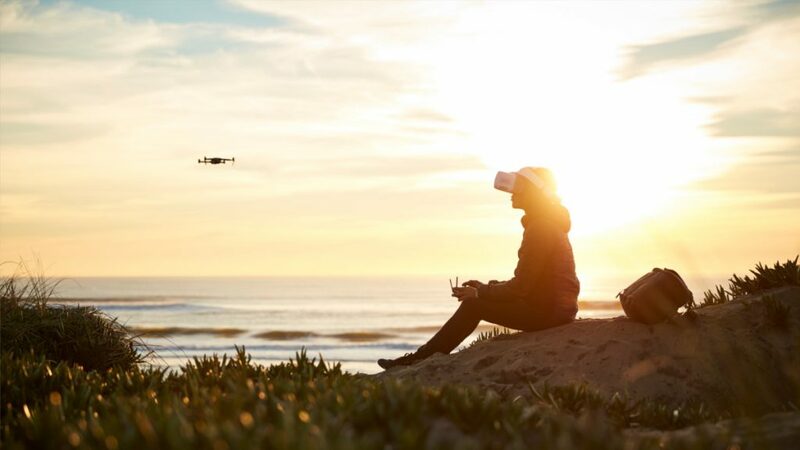 As a peripheral for the Mavic Pro, a high-end accessory allowing you to instantly share your view from the sky with friends and family, we’re loving the DJI Goggles. As a tool to put you in the hot seat of your drone, maybe try some racing maneuvers, we find the display to be too large. Yes, it’s beautiful and very immersive, but it is a bit of a strain on the eyes to scan that much screen real estate at high speeds. 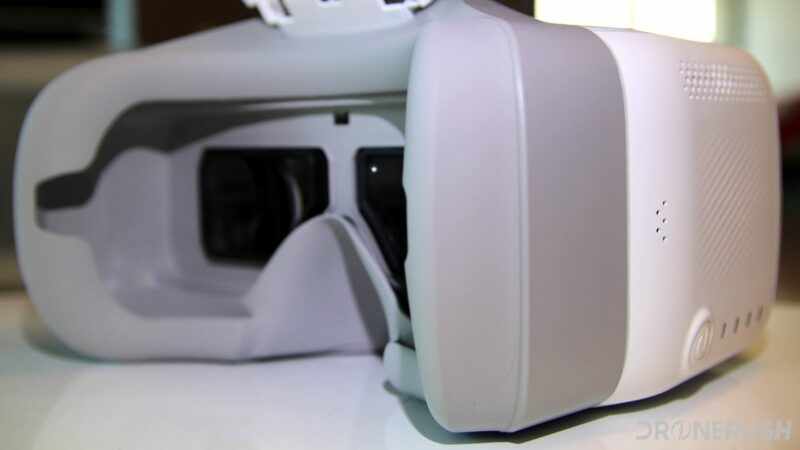 When you connect the DJI Goggles to a PC or other HDMI device, you have the option to adjust the effective display size. You can almost reduce the display area to half of its full presentation. This proves great for focusing on single things, which is what I’m saying about racing, you need to see more without having to look so hard. Racing aside, if you are enjoying a wide landscape, flying high and just enjoying the view, wearing the DJI Goggles while you fly your Mavic Pro is near breathtaking. Just remember, many countries require a direct line of sight to your drone, you will need a qualified spotter or to fly indoors if you wish to pilot and wear this or any other VR headset. We have more VR headset coverage on our partner site VRSource.com. For all the latest on all kinds of reality, check us out! DJI listened to us all, at least those of us that envisioned using the DJI Goggles for racing. 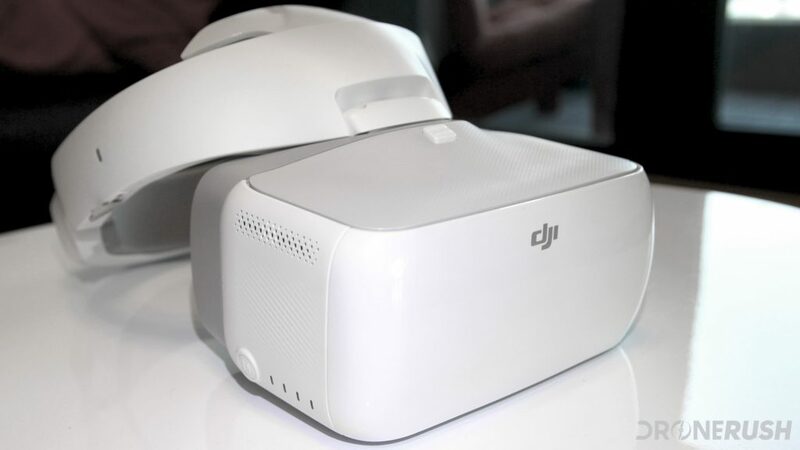 Improving latency significantly, the new DJI Goggles Racing Edition, along with combined Ocusync camera and transmitter for your racing drone, are the answer. We do not know for sure that you’ll see faster video rendering from the Mavic Pro, but we’ll be sure to test that out as soon as we can. What really, really matters for any display when connected to your drone is video quality. We know that the Mavic Pro can capture some near flawless stabilized video from the sky, but we often experience a broken signal back at our remote. More than once we’ve had to restart the DJI GO 4 app mid-flight just to regain FPV video. So far, the DJI Goggles put the mobile app to shame. Streaming 1080p 30fps in close range, our testing so far has experienced no freezes, no jitter, just crisp clear video. This is one of two settings, the first mode offers up 1080p at close range, then downgrades that to 720p 30fps when you get far away, or there is interference. The other option is Smooth mode, which is 720p 60fps all the way. Only the Mavic Pro and the Inspire 2 are set to provide 1080p video streams to the DJI Goggles. HD streams are great, but there is one key factor that must remain else you break the experience, you cannot have a delay. DJI has worked hard to bring us 110ms latency between Goggles and Mavic Pro. This is a best case scenario, mind you, but we have yet to experience any real delays in the video. So far, we have nothing but good things to say. There is an inherent risk flying your drone while huddled away inside a pair of VR goggles. With risk comes reward, right? In this case, the reward from the DJI Goggles is an immersive viewing experience from the Mavic Pro flying above you. The simple fact that you connect wirelessly is a winning feature in our books. We know that racing drones enjoy this, but this is one of the first that we know of that can connect two headset simultaneously to a single drone in Full HD. If that is not unique enough, don’t forget there are ways to fly your drone using the goggles. 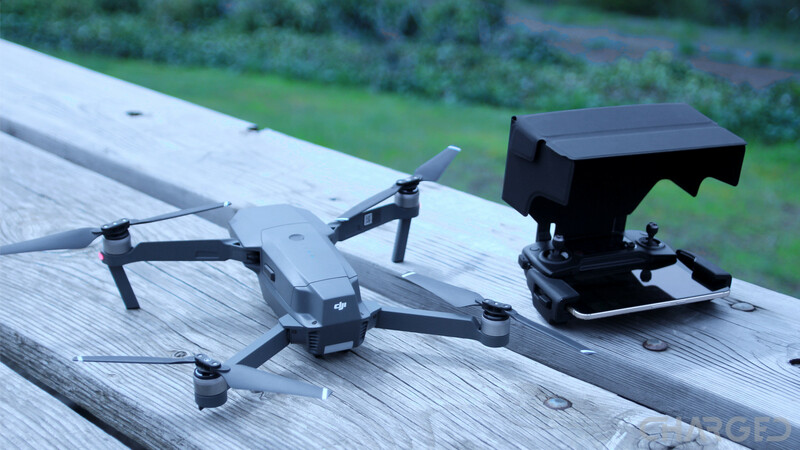 Putting it all together, you’ll be dropping at least $999 to get the Mavic Pro, we still recommend getting the extra batteries and tidbits in the Fly More bundle for $1299. 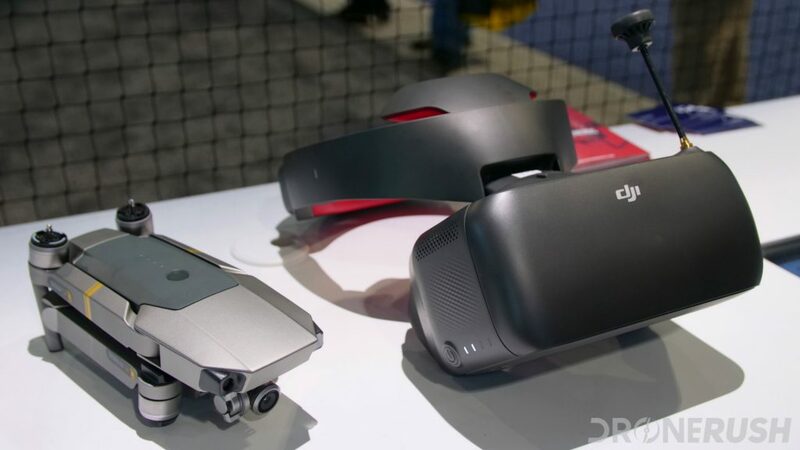 Then, the DJI Goggles are $449. This is a significant investment in some serious gear, not exactly just toys to play with. If you have a Mavic Pro already, adding on the DJI Goggles is a fun and exciting addition to your collection of gear. If you are purchasing all from scratch, you’re dropping a fair amount of money, but you are getting two powerful devices that work extremely well together, and yet work extremely well apart. It all comes down to preference, we dare say. If you are looking for the absolute best camera in the sky, the Mavic Pro is only beat by more expensive flying machines. If you are looking for a stand-alone VR headset, we’ve got a lot of testing to do vs some of the competition, but we think the DJI Goggles more than hold there own. Really, combining these two devices makes for an experience. This shared experience of the marvels of drone photography in the immersion of VR could be what makes it all worth it for you. What do you say, do the DJI Goggles add value to the Mavic Pro, or will you put your new headset to use in other ways?